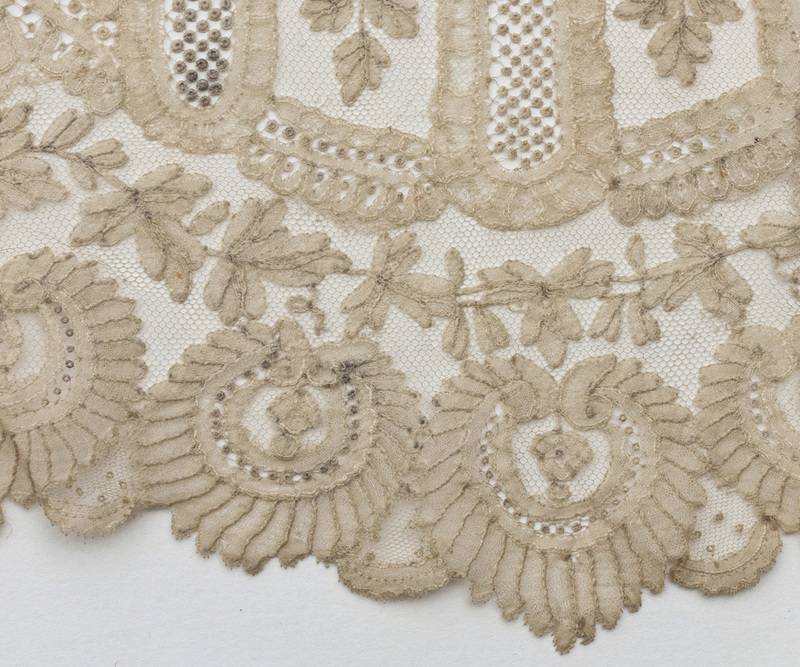 Brussels handmade lace has been an integral part of high style fashion since the 17th century, although it was produced earlier. In quality and price, it stands at the pinnacle of the universe of laces, allowing Brussels lace makers to remain in business until the end of the 19th century. Our piece is c.1850-1875. This fine Brussels mixed lace flounce is composed of of bobbin lace and needle lace motifs, applied to a machine net ground. The flounce resided in a private collection for many years. It is our good fortune that it was the custom to remove expensive pieces of heirloom lace from garments and store them for future use. 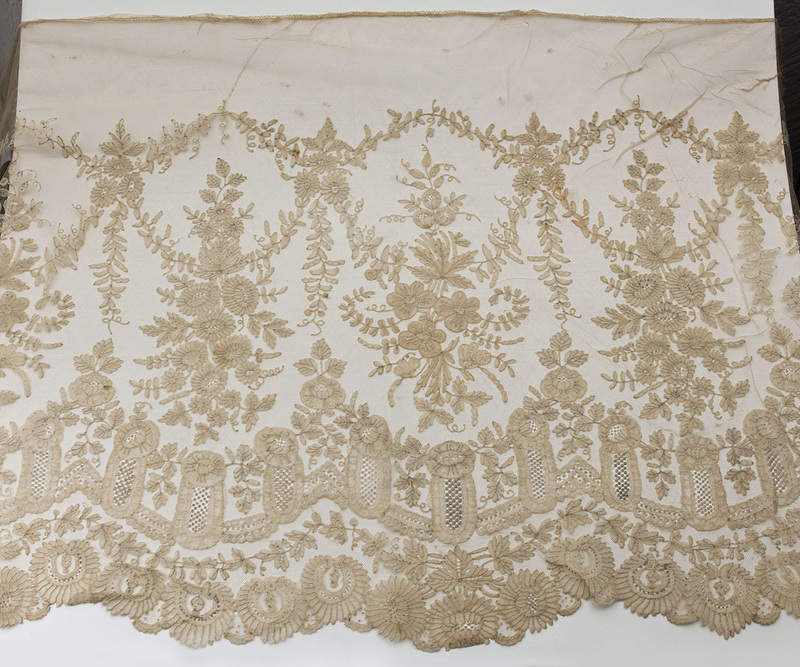 Today the cost would be prohibitive to reproduce this magnificent lace. Such pieces are eagerly sought for use in bridal gowns or veils. 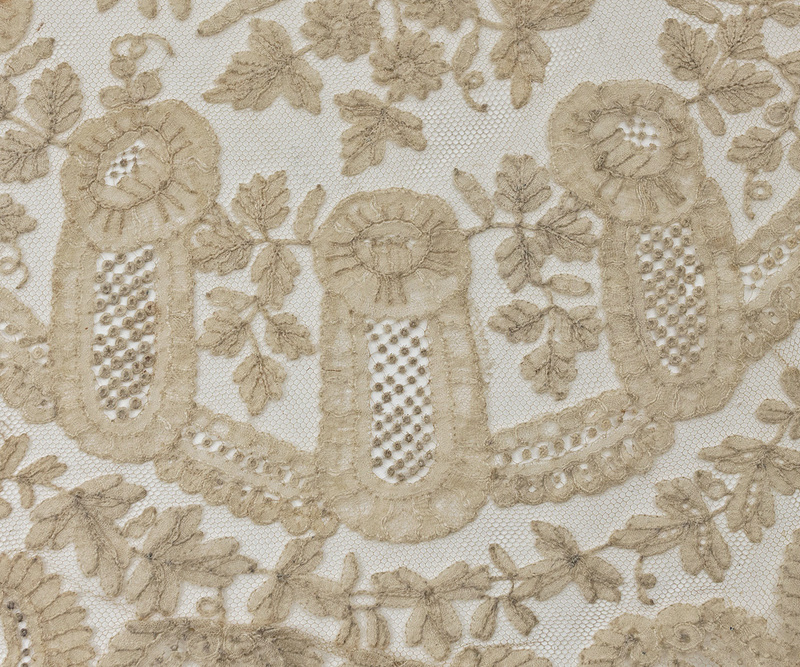 The needle lace can be seen best as pointillist motifs within three vertical ovals. One of several fine examples of bobbin lace in the piece appears as three central flowers. For the serious collector, this lace piece has the added advantage of retaining the original unwashed surface, an antique patina which is the tribute that time pays to beauty. 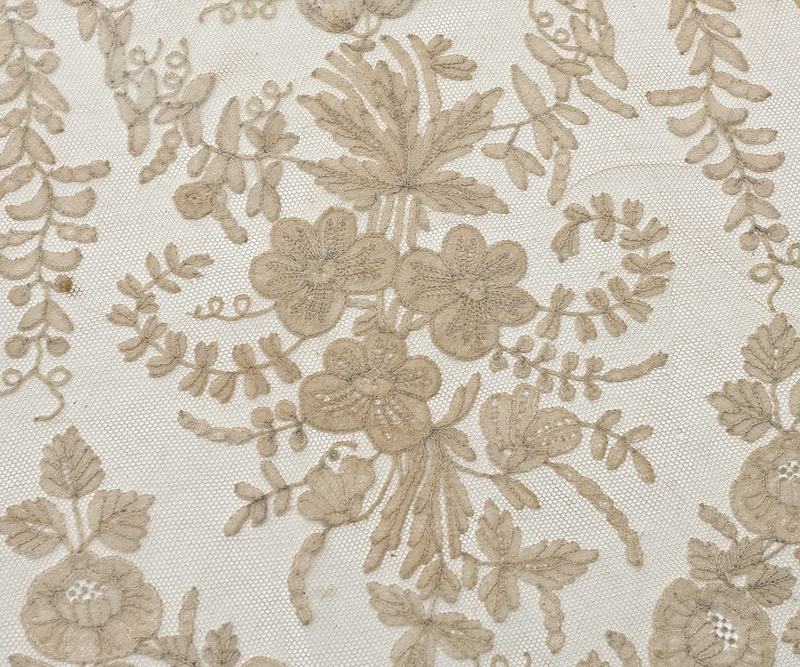 Celebrated for its its delicacy and beauty, Brussels lace was first produced in the 15th century. Since it was created out of the finest spun thread, it could not be made by machine. Originally, it could not be purchased outside of Belgium; hence the exorbitant cost of handmade Brussels lace. The term Brussels lace strictly interpreted refers to a type of bobbin lace, in which the pattern is made first, and then the ground (réseau) is added, also using bobbin lace. The condition is almost excellent. The lace pattern is almost perfect with just a few pin-prick-size breaks. In the upper plain edge are a few breaks and mends, which probably occurred when the flounce was removed from a gown. In Excellent condition, this peerless piece would retail for $4500 to $4800. The flounce is 4 3/4 yards long and 20" wide. The lace pattern is 16" wide.